The first attempt at rendezvous was made on June 3, 1965, when US astronaut Jim McDivitt tried to maneuver his Gemini 4 craft to meet its spent Titan II launch vehicle's upper stage. McDivitt was unable to get close enough to achieve station-keeping, due to depth-perception problems, and stage propellant venting which kept moving it around. 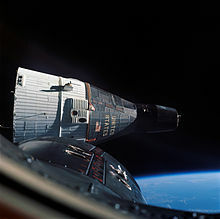 However, the Gemini 4 attempts at rendezvous were unsuccessful largely because NASA engineers had yet to learn the orbital mechanics involved in the process. Simply pointing the active vehicle's nose at the target and thrusting was unsuccessful. If the target is ahead in the orbit and the tracking vehicle increases speed, its altitude also increases, actually moving it away from the target. The higher altitude then increases orbital period due to Kepler's third law, putting the tracker not only above, but also behind the target. The proper technique requires changing the tracking vehicle's orbit to allow the rendezvous target to either catch up or be caught up with, and then at the correct moment changing to the same orbit as the target with no relative motion between the vehicles (for example, putting the tracker into a lower orbit, which has a shorter orbital period allowing it to catch up, then executing a Hohmann transfer back to the original orbital height). As GPO engineer André Meyer later remarked, "There is a good explanation for what went wrong with rendezvous." The crew, like everyone else at MSC, "just didn't understand or reason out the orbital mechanics involved. 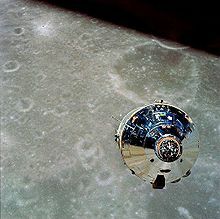 As a result, we all got a whole lot smarter and really perfected rendezvous maneuvers, which Apollo now uses." Somebody said ... when you come to within three miles (5 km), you've rendezvoused. If anybody thinks they've pulled a rendezvous off at three miles (5 km), have fun! This is when we started doing our work. I don't think rendezvous is over until you are stopped – completely stopped – with no relative motion between the two vehicles, at a range of approximately 120 feet (37 m). That's rendezvous! From there on, it's stationkeeping. That's when you can go back and play the game of driving a car or driving an airplane or pushing a skateboard – it's about that simple. [The Russian rendezvous] was a passing glance—the equivalent of a male walking down a busy main street with plenty of traffic whizzing by and he spots a cute girl walking on the other side. He's going 'Hey wait' but she's gone. That's a passing glance, not a rendezvous. Now if that same male can cut across all that traffic and nibble on that girl's ear, now that's a rendezvous! The first docking of two spacecraft was achieved on March 16, 1966 when Gemini 8, under the command of Neil Armstrong, rendezvoused and docked with an unmanned Agena Target Vehicle. Gemini 6 was to have been the first docking mission, but had to be cancelled when that mission's Agena vehicle was destroyed during launch. The Soviets carried out the first automated, unmanned docking between Cosmos 186 and Cosmos 188 on October 30, 1967. The first Soviet cosmonaut to attempt a manual docking was Georgy Beregovoy who unsuccessfully tried to dock his Soyuz 3 craft with the unmanned Soyuz 2 in October 1968. He was able to bring his craft from 200 meters (660 ft) to as close as 30 centimetres (1 ft), but was unable to dock before exhausting his maneuvering fuel. The Soviet's first successful manned docking occurred on January 16, 1969 when Soyuz 4 and Soyuz 5 docked and exchanged two crew members. The first rendezvous of two spacecraft from different countries took place on July 17, 1975, when an Apollo spacecraft docked with a Soyuz spacecraft as part of the Apollo-Soyuz Test Project. The first multiple space docking took place when both Soyuz 26 and Soyuz 27 were docked to the Salyut 6 space station during January 1978. Damaged solar arrays on Mir's Spektr module following a collision with an unmanned Progress spacecraft in September 1997 as part of Shuttle-Mir. The Progress spacecraft were used for re-supplying the station. In this space rendezvous gone wrong, the Progress collided with Mir, beginning a depressurization that was halted by closing the hatch to Spektr. A rendezvous takes place each time a spacecraft brings crew members or supplies to an orbiting space station. The first spacecraft to do this was Soyuz 11, which successfully docked with the Salyut 1 station on June 7, 1971. Human spaceflight missions have successfully made rendezvous with six Salyut stations, with Skylab, with Mir and with the International Space Station (ISS). Currently Soyuz spacecraft are used at approximately six month intervals to transport crew members to and from ISS. Robotic spacecraft are also used to rendezvous with and resupply space stations. Soyuz and Progress spacecraft have automatically docked with both Mir and the ISS using the Kurs docking system, Europe's Automated Transfer Vehicle also uses this system to dock with the Russian segment of the ISS. Several unmanned spacecraft use NASA's berthing mechanism rather than a docking port. The Japanese H-II Transfer Vehicle (HTV), SpaceX Dragon, and Orbital Sciences' Cygnus spacecraft all maneuver to a close rendezvous and maintain station-keeping, allowing the ISS Canadarm2 to grapple and move the spacecraft to a berthing port on the US segment. The Russian segment only uses docking ports so it is not possible for HTV, Dragon and Cygnus to find a berth there. Space rendezvous has been used for a variety of other purposes, including recent service missions to the Hubble Space Telescope. 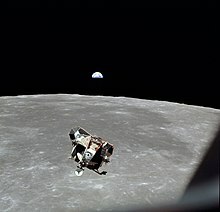 Historically, for the missions of Project Apollo that landed astronauts on the Moon, the ascent stage of the Apollo Lunar Module would rendezvous and dock with the Apollo Command/Service Module in lunar orbit rendezvous maneuvers. Also, the STS-49 crew rendezvoused with and attached a rocket motor to the Intelsat VI F-3 communications satellite to allow it to make an orbital maneuver. Possible future rendezvous may be made by a yet to be developed automated Hubble Robotic Vehicle (HRV), and by the CX-OLEV, which is being developed for rendezvous with a geosynchronous satellite that has run out of fuel. The CX-OLEV would take over orbital stationkeeping and/or finally bring the satellite to a graveyard orbit, after which the CX-OLEV can possibly be reused for another satellite. Gradual transfer from the geostationary transfer orbit to the geosynchronous orbit will take a number of months, using Hall effect thrusters. The standard technique for rendezvous and docking is to dock an active vehicle, the "chaser", with a passive "target". This technique has been used successfully for the Gemini, Apollo, Apollo/Soyuz, Salyut, Skylab, Mir, ISS, and Tiāngōng programs. To properly understand spacecraft rendezvous it is essential to understand the relation between spacecraft velocity and orbit. A spacecraft in a certain orbit cannot arbitrarily alter its velocity. Each orbit correlates to a certain orbital velocity. If the spacecraft fires thrusters and increases (or decreases) its velocity it will obtain a different orbit, one that correlates to the higher (or lower) velocity. For circular orbits, higher orbits have a lower orbital velocity. Lower orbits have a higher orbital velocity. For orbital rendezvous to occur, both spacecraft must be in the same orbital plane, and the phase of the orbit (the position of the spacecraft in the orbit) must be matched. The "chaser" is placed in a slightly lower orbit than the target. The lower the orbit, the higher the orbital velocity. The difference in orbital velocities of chaser and target is therefore such that the chaser is faster than the target, and catches up with it. Once the two spacecraft are sufficiently close, the chaser's orbit is synchronized with the target's orbit. That is, the chaser will be accelerated. This increase in velocity carries the chaser to a higher orbit. The increase in velocity is chosen such that the chaser approximately assumes the orbit of the target. Stepwise, the chaser closes in on the target, until proximity operations (see below) can be started. In the very final phase, the closure rate is reduced by use of the active vehicle's reaction control system. Docking typically occurs at a rate of 0.1 ft/s (0.030 m/s) to 0.2 ft/s (0.061 m/s). A variety of spacecraft control techniques may be used to effect the translational and rotational maneuvers necessary for proximity operations and docking. The two most common methods of approach for proximity operations are in-line with the flight path of the spacecraft (called V-bar, as it is along the velocity vector of the target) and perpendicular to the flight path along the line of the radius of the orbit (called R-bar, as it is along the radial vector, with respect to Earth, of the target). The chosen method of approach depends on safety, spacecraft / thruster design, mission timeline, and, especially for docking with the ISS, on the location of the assigned docking port. The V-bar approach is an approach of the "chaser" horizontally along the passive spacecraft's velocity vector. That is, from behind or from ahead, and in the same direction as the orbital motion of the passive target. The motion is parallel to the target's orbital velocity. In the V-bar approach from behind, the chaser fires small thrusters to increase its velocity in the direction of the target. This, of course, also drives the chaser to a higher orbit. To keep the chaser on the V-vector, other thrusters are fired in the radial direction. If this is omitted (for example due to a thruster failure), the chaser will be carried to a higher orbit, which is associated with an orbital velocity lower than the target's. Consequently, the target moves faster than the chaser and the distance between them increases. This is called a natural braking effect, and is a natural safeguard in case of a thruster failure. STS-104 was the third Space Shuttle mission to conduct a V-bar arrival at the International Space Station. The V-bar, or velocity vector, extends along a line directly ahead of the station. Shuttles approach the ISS along the V-bar when docking at the PMA-2 docking port. The R-bar approach consists of the chaser moving below or above the target spacecraft, along its radial vector. The motion is orthogonal to the orbital velocity of the passive spacecraft. When below the target the chaser fires radial thrusters to close in on the target. By this it increases its altitude. However, the orbital velocity of the chaser remains unchanged (thruster firings in the radial direction have no effect on the orbital velocity). Now in a slightly higher position, but with an orbital velocity that does not correspond to the local circular velocity, the chaser slightly falls behind the target. Small rocket pulses in the orbital velocity direction are necessary to keep the chaser along the radial vector of the target. If these rocket pulses are not executed (for example due to a thruster failure), the chaser will move away from the target. This is a natural braking effect. For the R-bar approach, this effect is stronger than for the V-bar approach, making the R-bar approach the safer one of the two. Generally, the R-bar approach from below is preferable, as the chaser is in a lower (faster) orbit than the target, and thus "catches up" with it. For the R-bar approach from above, the chaser is in a higher (slower) orbit than the target, and thus has to wait for the target to approach it. Astrotech proposed meeting ISS cargo needs with a vehicle which would approach the station, "using a traditional nadir R-bar approach." The nadir R-bar approach is also used for flights to the ISS of H-II Transfer Vehicles, and of SpaceX Dragon vehicles. An approach of the active, or "chaser," spacecraft horizontally from the side and orthogonal to the orbital plane of the passive spacecraft—that is, from the side and out-of-plane of the orbit of the passive spacecraft—is called a Z-bar approach. ^ Gatland, Kenneth (1976). Manned Spacecraft, Second Revision. New York: Macmillan Publishing Co., Inc. pp. 117–118. ISBN 0-02-542820-9. ^ Hall, Rex; David J. Shayler (2001). The Rocket Men: Vostok & Voskhod, The First Soviet Manned Spaceflights. New York: Springer–Praxis Books. pp. 185–191. ISBN 1-85233-391-X. ^ Buzz Aldrin. "Orbital Rendezvous". ^ Buzz Aldrin. "From Earth to Moon to Earth" (PDF). Archived from the original (PDF) on May 27, 2014. ^ a b "Gemini 4". Encyclopedia Astronautica. Archived from the original on November 29, 2010. ^ "On The Shoulders of Titans - Ch12-7". www.hq.nasa.gov. Retrieved April 9, 2018. ^ "NASA - NSSDCA - Spacecraft - Details". nssdc.gsfc.nasa.gov. Retrieved April 9, 2018. ^ Mark Wade. "Soyuz 11". Encyclopedia Astronautica. Archived from the original on October 30, 2007. ^ Bryan Burrough, Dragonfly: NASA and the crisis aboard Mir, (1998, ISBN 0-88730-783-3) 2000, ISBN 0-06-093269-4, page 65, "Since 1985 all Russian spacecraft had used the Kurs computers to dock automatically with the Mir station" ... "All the Russian commanders had to do was sit by and watch." ^ "orbitalrecovery.com". www.orbitalrecovery.com. Retrieved April 9, 2018. ^ "TRACK AND CAPTURE OF THE ORBITER WITH THE SPACE STATION REMOTE MANIPULATOR SYSTEM" (PDF). NASA. ^ a b c d Wertz, James R.; Bell, Robert (2003). "Autonomous Rendezvous and Docking Technologies – Status and Prospects" (PDF). SPIE AeroSense Symposium. Space Systems Technology and Operations Conference, Orlando Florida, April 21–25, 2003. Paper 5088-3. Retrieved October 31, 2011. ^ λmax is the angular radius of the spacecraft’s true horizon as seen from the center of the planet; for LEO, it is the maximum Earth central angle from the altitude of the spacecraft. ^ Lee, Daero; Pernicka, Henry (2010). "Optimal Control for Proximity Operations and Docking" (PDF). International Journal of Aeronautical & Space Science. 11 (3): 206–220. Bibcode:2010IJASS..11..206L. doi:10.5139/IJASS.2010.11.3.206. Archived from the original (PDF) on March 31, 2012. Retrieved November 3, 2011. ^ a b Pearson, Don J. (November 1989). "Shuttle Rendezvous and Proximity Operations". originally presented at COLLOQUE: MECANIQUE SPATIALE (SPACE DYNAMICS) TOULOUSE, FRANCE NOVEMBER 1989. NASA. Retrieved November 26, 2011. ^ "STS-104 Crew Interviews with Charles Hobaugh, Pilot". NASA. ^ WILLIAM HARWOOD (March 9, 2001). "Shuttle Discovery nears rendezvous with station". SPACEFLIGHT NOW. ^ Johnson, Michael D.; Fitts, Richard; Howe, Brock; Hall, Baron; Kutter, Bernard; Zegler, Frank; Foster; Mark (September 18, 2007). "Astrotech Research & Conventional Technology Utilization Spacecraft (ARCTUS)" (PDF). AIAA SPACE 2007 Conference & Exposition. Long Beach, California. p. 7. Archived from the original (PDF) on February 27, 2008. ^ Bessel, James A.; Ceney, James M.; Crean, David M.; Ingham, Edward A.; Pabst, David J. (December 1993). "Prototype Space Fabrication Platform". Air Force Institute Of Technology, Wright-Patterson AFB, Ohio – School Of Engineering. Accession number ADA273904. Retrieved November 3, 2011. Wikimedia Commons has media related to Space rendezvous. "Lunar Orbit Rendezvous and the Apollo Program". NASA.